Use Contact Us on the website. Input your information and question, then you will be contacted. Your observations will be added to a continually growing database that is used to monitor population trends, nesting phenology, and the behavior of birds across the country. 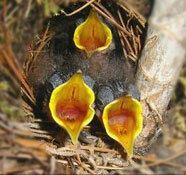 NestWatch teaches people about bird breeding biology and engages them in collecting and submitting nest records. Such records include information about nest site location, habitat, species, and number of eggs, young, and fledglings. “Citizen scientists” submit their nest records to our online database where their observations are compiled with those of other participants in a continentwide effort to better understand and manage the impacts of environmental change on bird populations. Anywhere you can find a nesting pair of birds. We invite people of all ages who are interested in the natural world to help monitor the success of nesting birds and better understand the threats they face. NestWatch aims to provide a unified nest-monitoring scheme to track reproductive success for all North American breeding birds. Nesting birds between Feb in warm climates thru to Aug in the cooler climates.